The government of the Republic of Mordovia, in the Volga basin, is confident that Saransk will host the 2018 FIFA World Cup without a hitch. To the surprise of many, Saransk, with a population of 300,000 and located in the Republic of Mordovia in the open expanses of the Volga basin, won the right, along with Moscow and St. Petersburg, to host the 2018 FIFA World Cup. Of the 11 Russian cities that will host soccer matches four years from now, Saransk is perhaps the least known outside of Russia. However, the government of Mordovia, whose capital is Saransk, intends to fix that. Mordovia’s Deputy Prime Minister Alexei Merkushkin told RIR about the region’s preparations for the World Cup and the future arrival of thousands of foreign guests to the city. 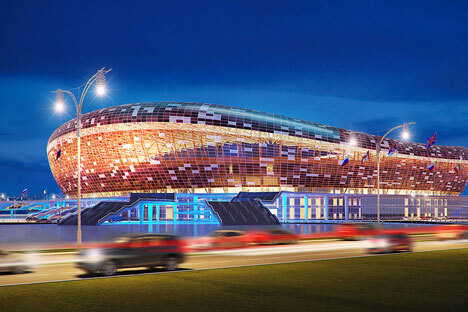 RIR:What stage are you currently at in the construction of the new stadium in Saransk? Alexei Merkushkin: We had decided to build a new stadium back before Russia received the rights to host the World Cup, and we started to construct it earlier than other cities, so naturally we have advanced further. The only hitch stemmed from the fact that we had to make adjustments to the design last year in order to comply with the new, sixth version of the FIFA stadium requirements handbook. We also slightly altered the technical solutions (particularly the number of sky boxes) due to the fact that we [then] announced that the stadium would be for the group stage matches and the quarter-finals (we had previously been preparing the stadium exclusively for group stage matches). RIR:Thousands of fans will come to the World Cup. A few days ago, you announced plans to build new hotel facilities in Saransk. Who will invest in these projects? A.M.: Financing from the state budget is not provided for accommodation in the Russian program of World Cup preparations. All of the investors are Russian. A Sheraton Hotel has been under construction for a year and a half, and it will be finished next year. The results of an investment tender were summed up for the Mercure just a few days ago. RIR: You stated that a portable capsule hotel is jointly being built for fans with British company Snoozebox, and that one of the hotels will subsequently be transformed into a residential complex. What is that project? A.M.: The concept is that we aren’t going to build more than what the city needs. The Tavla residential complex is an example of what we want. This is purely a real estate development investment project. We realize that it is economically too burdensome for an investor, which is why we have developed a set of government support measures. With budget funds we are preparing the site for the investor, establishing all of the outside networks, and subsidizing the costs of the design documentation. We will start building in the spring of next year. There will tentatively be six 25-30-story towers and 1,700 one- and two-room apartments. The complex will be located 500-600 meters from the stadium in a growing part of the city. With regards to Snoozebox, that company has worked at the London Olympics and at Formula One. They offer an interesting concept for portable hotels. It is basically a container that arrives on-site, is unfolded, and is later collected and taken away. It can be simple or higher level, up to four stars. We gave them a land plot not far from the airport, next to a pond. RIR: What about the airport and transport infrastructure? A.M.: The federal program is allocating 2.5 billion rubles (approximately $65 million) for the reconstruction of runways, aircraft parking, and navigation systems. We’re going to build a new terminal next spring, and we’ll provide another temporary terminal specially for the World Cup for 1,100 passengers an hour in 2018. In all likelihood, direct construction of the terminal will be performed in the form of a public-private partnership. We consider the airport to be a strategically important resource, which is why we won’t completely transfer it to private hands. We don’t have any major problems with other types of transport. There is a big railway hub in Ruzayevka, a satellite of Saransk. Trains will leave for Moscow from there every 10 minutes. Saransk is close enough to Moscow, so we don’t foresee any serious problems with guests coming from Europe in cars. RIR:How do you see the future of the stadium and the transport facilities? A.M.: We are trying to calculate everything and provide for everything. Take the airport, for example. Right now we are in the process of creating a local interregional airline with an international partner. This will run flights throughout the central part of Russia. We are using the low-cost model as a benchmark: small aircraft, frequent flights, low price. This model works in Brazil, in Canada, and in the United States. Interregional aviation is poorly developed in Russia. Interregional transport around the world cannot function without state support. The Russian Transport Ministry actively supports and subsidizes the development of interregional aviation. We are actually doing the new terminal for this new airline. We are working with the German company Sport Five on the future commercial use of the stadium. Such a structure will never pay for itself with just one soccer event. The best stadiums in the world host 150-200 events a year. Our advantage is that the stadium is in the city center, and a new district is growing around it. Our task is to build a compact, multifunctional, inexpensive, attractive stadium. There are two foreign companies interested in managing the stadium, and we are currently in negotiations. RIR: Experience shows that the most successful cities are those that offer an engaging story, an idea that presents the region is a special light. In your view, what is the key message that Saransk and Mordovia can offer the rest of the world? A.M.: One of the reasons they chose us, why FIFA gave Saransk a high mark, was because we are a national republic. That fact – that a Finno-Ugric region was granted the right to host World Cup matches – is very symbolic. We can surprise a lot of people. I won’t give away all our secrets, but one of the main areas of our work will be the ethno-cultural aspect. We want to demonstrate our culture, our cuisine, our history. I am sure our guests will like it.